Before I tell you what you must see in Athens in 4 days, you must trust me right? For sure you will find many itineraries and articles on Athens by searching the web — this one has been written, tried and tested by someone who has been living in Greece for 26 years. Having studied and worked in the hospitality industry for the past 17 years — I like to believe that I do know Athens well. 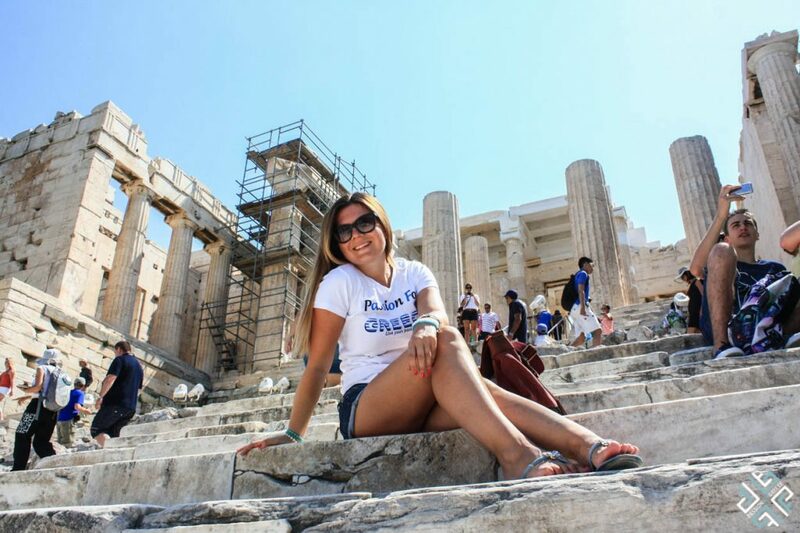 From actually taking guests on private tours of Athens, to recommending places to friends and travellers, going on numerous tours myself and having visited the Acropolis at least 50 times (no joke, it was a Sunday ritual to take all my parent’s business partners to the Acropolis since 1992) — let me introduce you to my Athens. 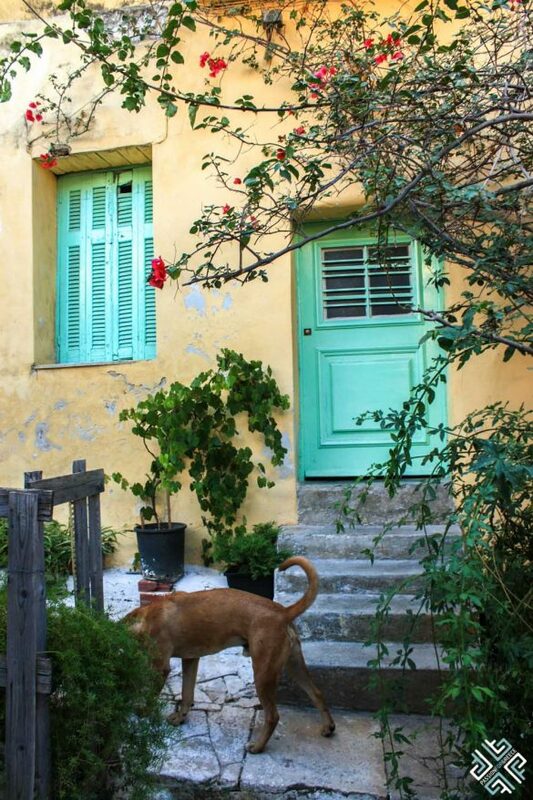 There is more to Athens than the city centre and the Acropolis. In fact Athens has one of the most beautiful rivieras in the world, the Athenian Riviera — with beautiful sandy beaches (Top 10 Beaches of Athens), world class marinas and luxury seaside resorts. A coastal road which begins in Palio Faliro and ends at the southernmost tip of Athens at the Temple of Poseidon — that’s the Athenian Riviera you absolutely must experience. There are numerous transportation options which you can choose from when arriving at the Athens International Airport. If you do like to travel in comfort then a taxi would be your best option. To avoid the hassle of waiting in line and to be sure that you are getting your own personal driver you can pre-book a car online prior to your arrival. You will be met by the driver holding a name sign as soon as you come out at the arrivals with a bottle of water and city map. There are plenty of taxis lined up right outside the Exit 3 on the Arrivals level. You will have to wait in queue to get your taxi. Taxis are a convenient option, specifically if you have a lot of luggage and you’re not tight on budget. You’ll find dozens of taxis standing at the designated Taxi waiting area, right after you get out of Exit 3 of Arrivals Level. The flat taxi rate is €38 from the airport to the city center. For arrivals from midnight until 5 am the cost is €54. One of the fastest means of transportation is the metro. Take line 3 which goes straight from the Athens International Airport to the city Centre (Syntagma Square). It runs every 30 minutes, 7 days a week, from 6:30 am to 11:30 pm. The duration of the trip is around 40 minutes and the price of the ticket is €10. The Athens metro is easy to use, there are escalators everywhere and elevators too. 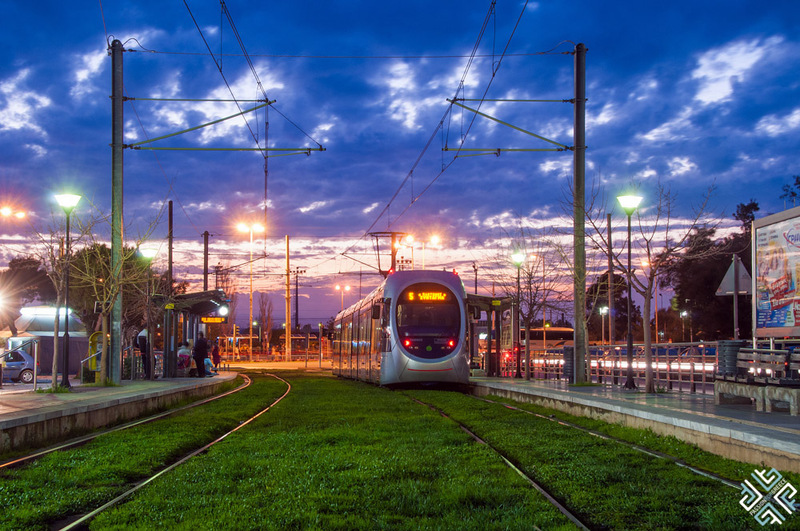 The Suburban railway is an electric train that leaves from the airport and goes to the main Athens Railway Station or also known as Larissa Station. From here you can catch the train to other destinations in Greece. If you opt for this option you will have to switch and continue to the city centre (Metro Line 3 to Egaleo). The same ticket applies. Cost €10. The express bus station is located outside the Arrivals. You can buy the ticket in one of the ticket booths located outside. There are five different bus lines depending on where you are going. The trip can take somewhere between 35 to 60 minutes. X95 is the bus that goes to Syntagma Square and can take from 30 to 60 minutes depending on the time of day. Cost €6. 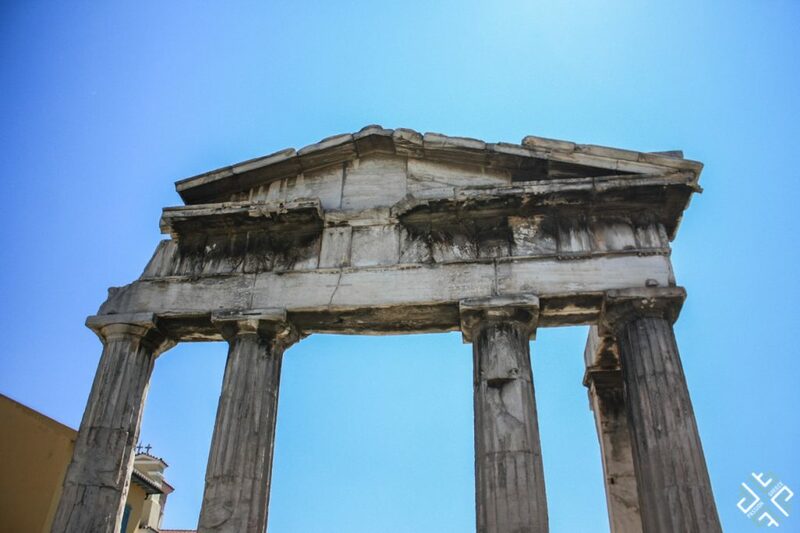 On your four day in Athens itinerary let’s start with the all time classic — the Acropolis. 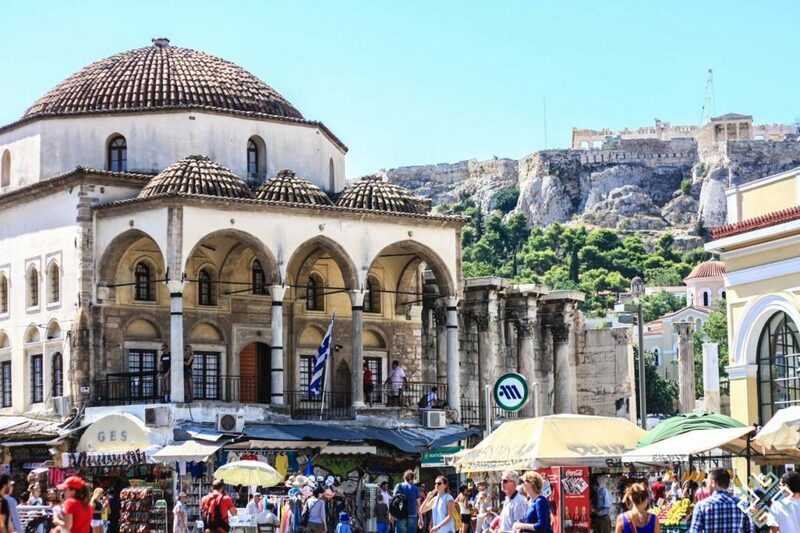 As cliche as it may sound you cannot leave Athens without climbing to the top of the oldest historical monuments in the world, a UNESCO World Heritage Site. 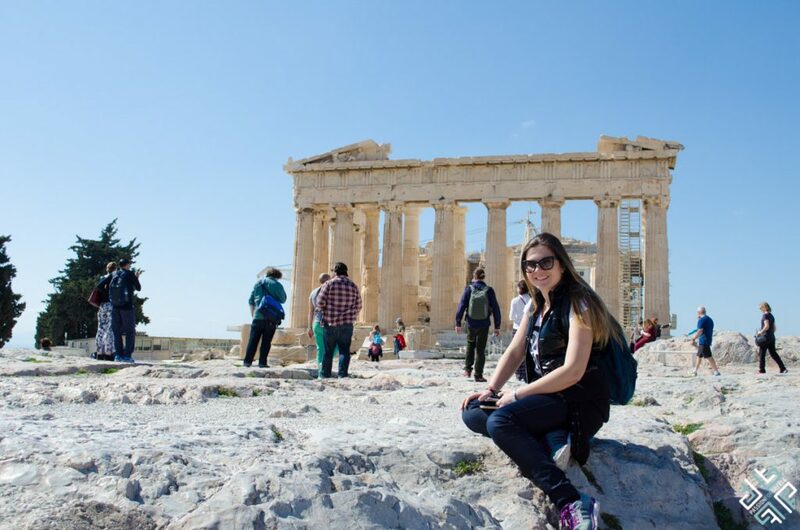 I recommend that you start your Athens city break with a visit to the Acropolis as it will give you the required knowledge and understanding of the ancient Greek civilisation before you explore the rest of the city. Crowning the highest point of the city of Athens (150 meters above sea level) — Acropolis has taken its name from two words Akron meaning the highest point and Polis translating as the city. Findings show that the hill where Acropolis stands until this day, was inhabited during the Neolithic period (4000/3500-3000 BC). In mid 5th century BC the Acropolis was the greatest cultural centre of its time. The most famous building at the Acropolis is the Parthenon which was dedicated to the goddess Athena and is considered to be the abiding symbol of Ancient Greece. The Parthenon was completed in 438 BC and is considered to be a pinnacle of the Doric order. Following a 10 year restoration and reconstruction period (2007- 2017) carried out by the Greek Ministry of Culture — the Parthenon is one of the highlights of the Acropolis. What else is there to see? 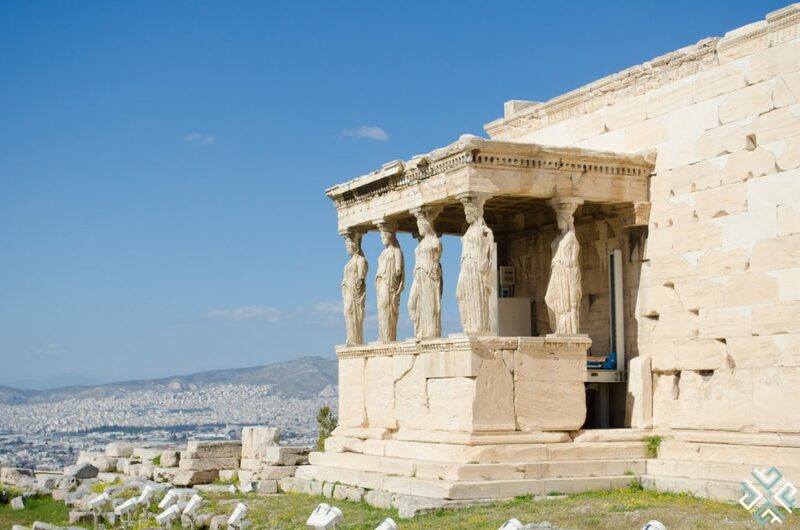 Don’t miss the Propylaia (the gateway to the Acropolis), the Erechtheion (the Temple which was dedicated both to Athena and Poseidon, decorated with the 6 female figures – Caryatids) and the Temple of Athena Nike (found right at the entrance of Propylaia). When is the best time to visit: Get there as early as possible to beat the crowds. It get extremely busy during the summer especially with the cruise ship passengers. Winter is a better time of year to visit as it is less crowded. Entrance to the Acropolis: Acropolis has two entrances, the main entrance is the one located in the west of the Dioysiou Aeropagitou pedestrian street which leads all the way from the Hadrian’s Arch. This is the busiest entrance. The second entrance is to the South, close to the Acropolis Museum. This entrance is less crowded and takes you through the Dionysus Sanctuary and the Dionysus Theater. Ticket price: There is a combined ticket for 30 € full price and 15 € reduced which allows you to visit the Acropolis of Athens, Ancient Agora of Athens, Archaeological Museum of Kerameikos, Hadrian’s Library, Kerameikos, Museum of the Ancient Agora, North slope of Acropolis, Olympieio, Roman Agora of Athens, South Slope of Acropolis. It is valid for 5 days. There is also the single use ticket at 20 € full price and 10 € reduced valid for one admission to this specific site, on a specific date. Seasonality: Tickets to the Acropolis cost 20€ from April 1st to October 30th and 10€ from November 1st to March 31st. You can buy the tickets online from the official website of the Hellenic Ministry of Culture and Sports where you can select the day and time-slot when you want to visit. 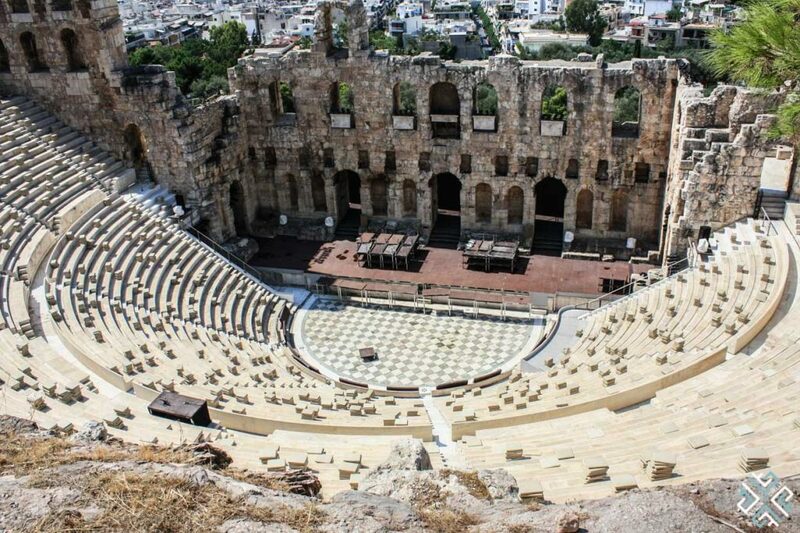 This ancient theatre is one of the must see attractions in Athens. Located at the foothill of the Acropolis overlooking the pedestrian street of Dioysiou Aeropagitou this magnificent amphitheater was built in AD 161 by an affluent Roman Herodes Atticus for his wife Regilla. 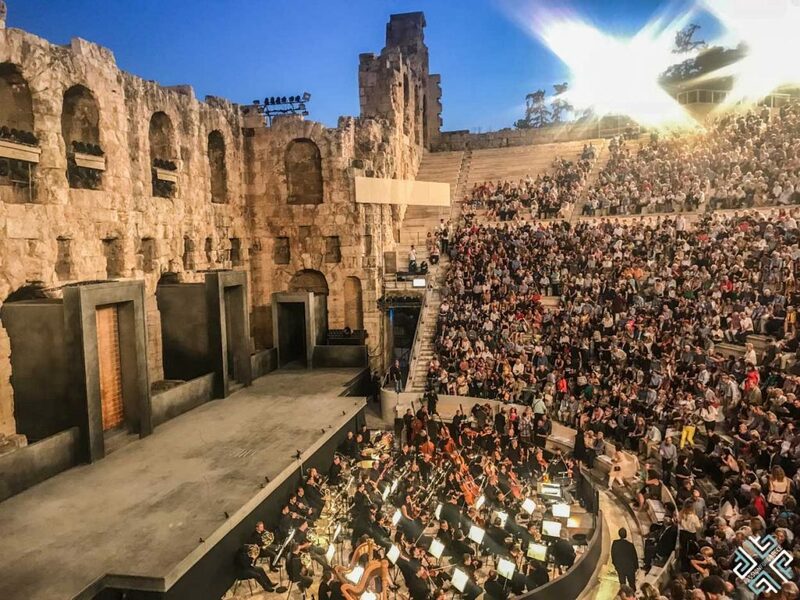 During the summer the Athens & Epidaurus Festival takes place at the Odeon of Herodes Atticus where you can enjoy some of the most fantastic performances of art, drama dance and music. Over the years, the theatre of Herodeon has welcomed some of the world’s most famous performance such as Luciano Pavarotti, Frank Sinatra, Sting, Maria Callas, just to name a few. The events are held here between May and October. Check out this website for performances, dates and tickets. Now if you want to see the Acropolis and all its highlights by yourself at your own leisure that’s perfectly fine, I have visited it on my own and with a tour. To be honest it is much nicer when you get a guided tour of the Acropolis as you will actually learn a lot of interesting things that you wouldn’t know otherwise, unless you are a history major or archeologist. If you are the tour-kind of person you can opt for the Acropolis of Athens Early Morning Guided Tour which lasts for 1.5 hours. What I love most about Get Your Guide Tours is that you can easily cancel your purchase 24 hours prior to the tour or vice-versa book on-the-go using their mobile app. This is a small group tour of maximum 18 people. Entry fee to the Acropolis is not included (€20 from April to October and €10 from November to March). Another option is to get a brief 30 minute introduction by a local guide as you walk towards the Acropolis. You can also skip the line which is a perfect option when you are traveling and tight for time. In this case you can book the Acropolis Skip-the-Line Ticket with Athens Welcome Walk. Entry ticket included! Want to enjoy a longer tour of this historical city? Then a 5 hour Athens, Acropolis and Acropolis Museum Including Entry Fees tour is your best option. 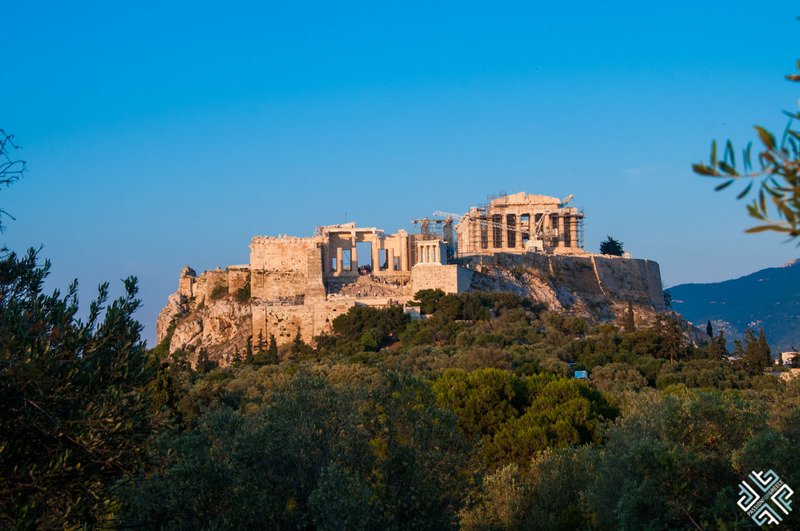 You will learn all about Athens’ fascinating history and culture, visit some of the most spectacular monuments, enjoy a tour through the Royal Gardens and explore one of the worlds top museums — the Acropolis Museum. 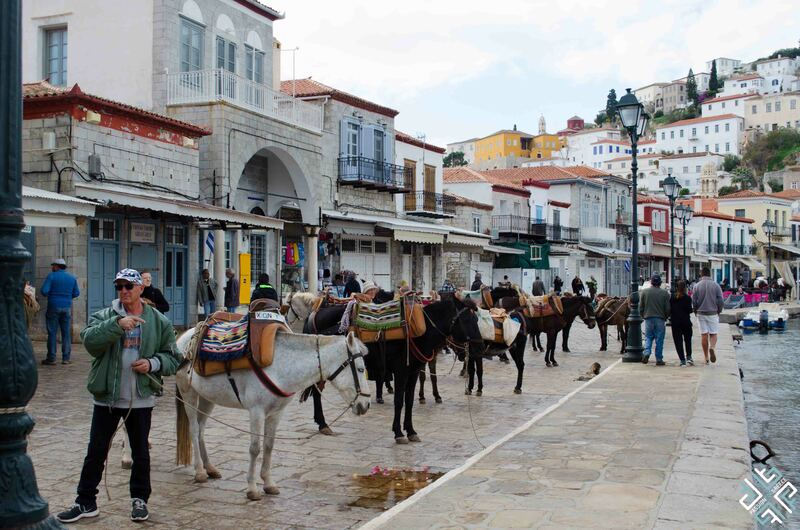 This tour also includes transportation from a centrally located hotel in Athens. Fan of Mythology? Then you must definitely join the Athens Mythology Highlights Tour where you will learn all about the birth of Dionysus and how Athena beat Poseidon over the title of the city of Athens. Read about my experience here. 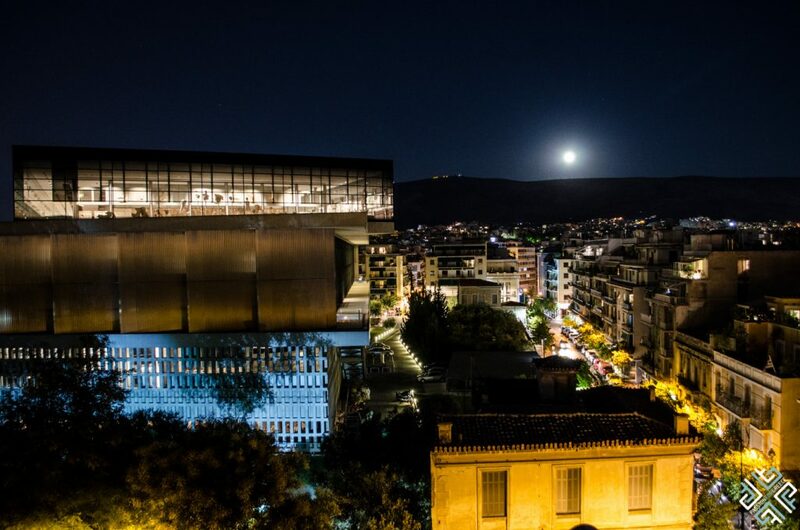 Since its opening in June 2009, the new Acropolis Museum has been voted as one of the best museums in the world. 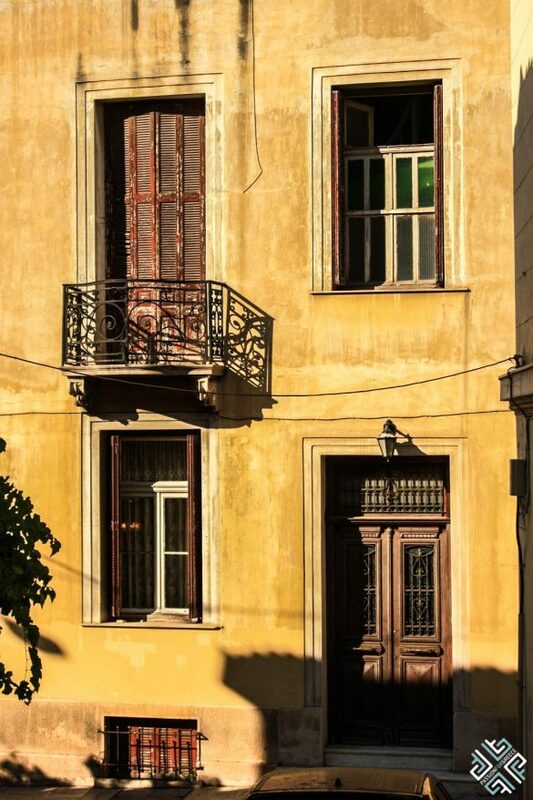 Constructed from large glass panes it stands tall in the heart of Athens’ historical city center. The museum was designed and completed by New York’s, Bernard Tschumi who also designed the Museum of Modern Art in New York among other world famous buildings. Together with the local Greek architect Michael Photiadis they created a spectacular home for Greece’s most valued historical possessions. The Acropolis Museum spans over three floors: on the top floor you will discover the frieze of the temple of Parthenon as well as 92 relief panels which were once part of the temple and depict the legendary battles which took place in the Greek mythology. On the first floor of the museum you will find the five Caryatids which are the original version of the maidens that supported the porch of the Erechtheion. The sixth one is housed in the British Museum in London, as it was moved there by Lord Elgin. The permanent exhibition on level one displays remnants from the archaic period — one of the highlights is the depict of Heracles wrestling a mythological beast, a lioness attacking a taurus, and a three bodied monster holdings objects. On the same level you will find the Archaic Gallery lined with statues dating back to the 7th century BC. The ground floor which is also the entrance of the museum is the Gallery of the Slopes that displays a collection of artefacts which depict how life was like in ancient Greece. The glass floor allows you to witness the excavations which were uncovered during the construction of the museum. 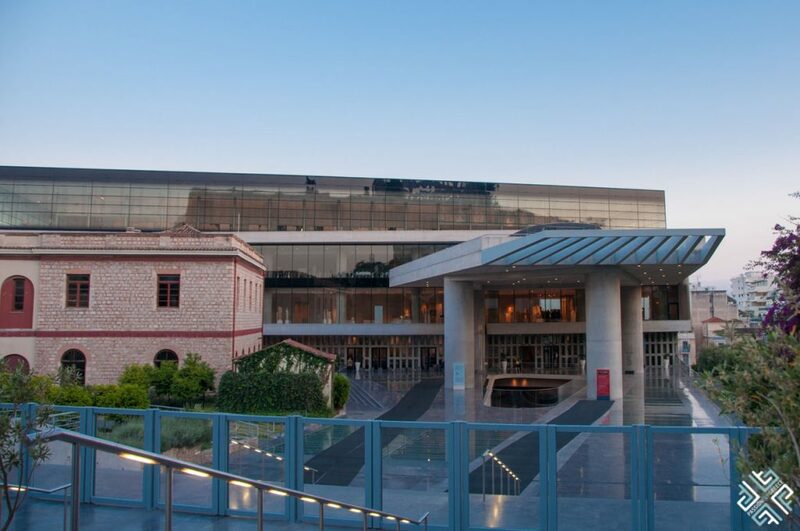 The Acropolis Museum features a restaurant which is open from 8am in the summer and 9am in the winter months. It serves breakfast, lunch and beverages throughout the week. Dinner is served until 10pm on Fridays. In the summer you can also enjoy the view of the Acropolis and the Acropolis Museum from the rooftop bar & restaurant POINT a. If you wish you can also book a 1.5 hour Athens Acropolis Museum Admission Ticket with Guided Tour. Located on the main road which leads to the Syntagma Square, the Hadrian’s Arch was build in 131 AD by Emperor Hadrian to separate the new and old cities of Athens. From one side of the arch there is an inscription that reads “This is Athens the former city of Theseus” while the other side says “This is the City of Hadrian not Theseus”. 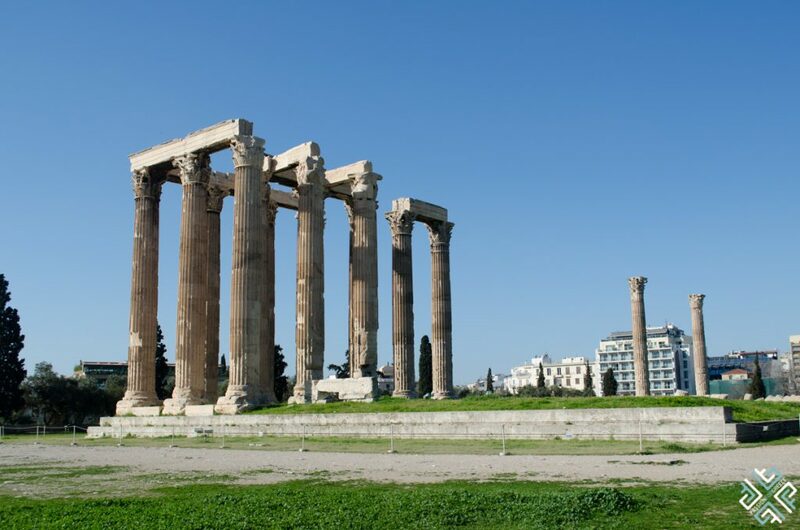 Soaring 500 meters above sea level the Temple of Olympian Zeus is located right next to the Hadrian’s Arch. 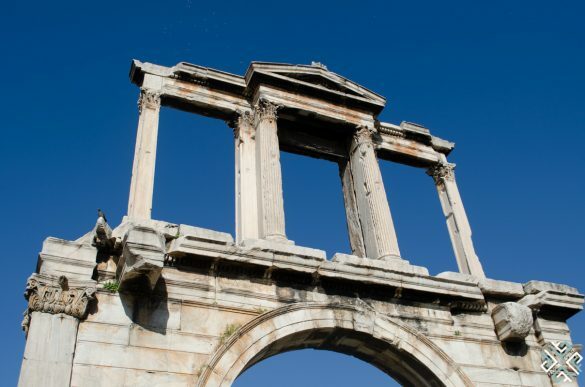 Its construction began in 515 BC by Pisistratus, the son of Hippocrates however it was only completed by Emperor Hadrian in 129 AD. The temple was built out of marble which was from Mount Pentelus and the structure was supported by 104 columns, only 15 of which remain standing until this day. 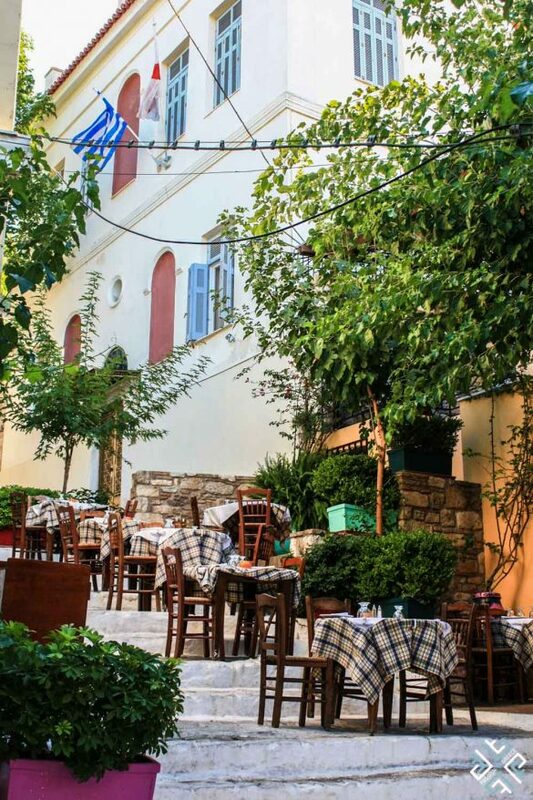 One of the most picturesque neighborhoods of Athens is Plaka and the quaint little historical village of Anafiotika which resembles the feeling of being on a Greek island. Wandering past this quiet neighbourhood you will quickly forget that you are in the heart of a major metropolis. Anafiotika was built in 19th century by builders who moved here from the Cyclades island of Anafi, located close to Santorini. This small authentic island has not been touched by mass tourism. 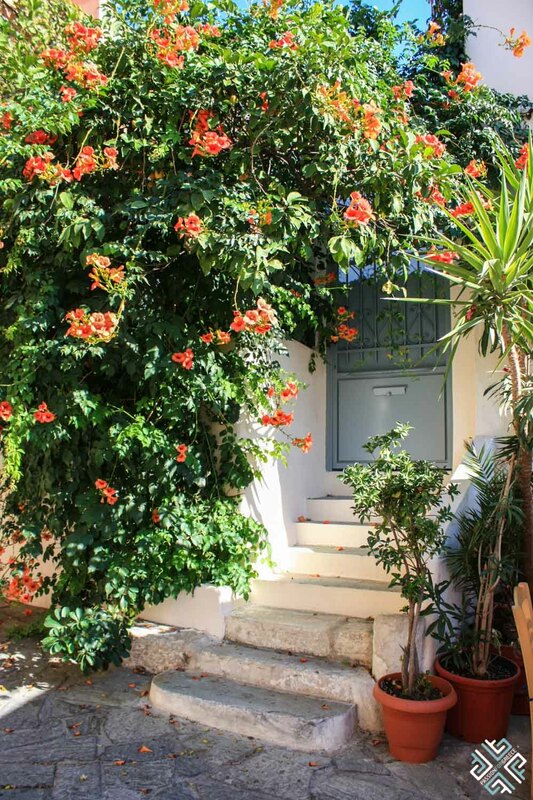 The houses resemble the same architecture, whitewashed buildings completed with colourful doors and windows, adorned with plants and bougainvillea pathways. There are no souvenir shops in this neighbourhood, but you can enjoy a refreshing beverage, lunch or dinner in one of the cafes and taverns that line the narrow streets. You can easily spend the entire afternoon wandering around and soaking in the tranquility of this special place. If you wish to treat yourself to a relaxing afternoon after a full day of exploring Athens, then a visit to an authentic Hammam will leave your body relaxed and ready to tackle your second day of the Athens itinerary. 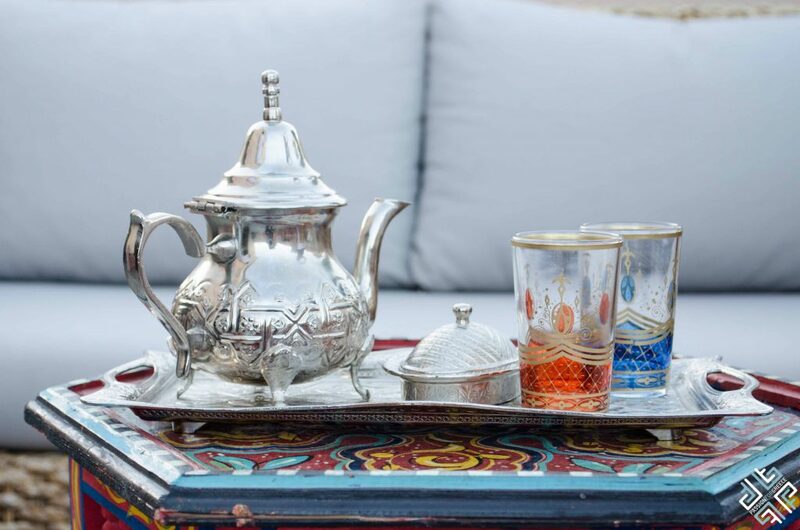 You can read all about my experience of visiting the Al Hammam which is located in Plaka. On your second day of the 4 days in Athens itinerary you can choose to visit the proposed Athens attractions based on your interests. The Panathenaic Stadium which is also commonly referred to as the Kallimarmaro stadium is one of Athens’ most important landmarks. Its history is closely linked to the modern Olympic Games which were held here for the first time in 1896. It also played a vital role in the Athens Olympic Games in 2004. The stadium is also the place where the Olympic flame commences its journey to the host cities of Olympic Games — Winter, Summer and Youth. It is one of the most visited sites therefore the best times to visit are either in the morning or in the evening. If you want something a little more original you can also opt for the Athens Highlights by Electric Trikke Bike tour where you can discover all the highlights of Athens on a 3-wheeled electric scooter. Where you will pass by the Panathenaic Stadium, the National Gardens as well as the Old neighbourhood of Athens. 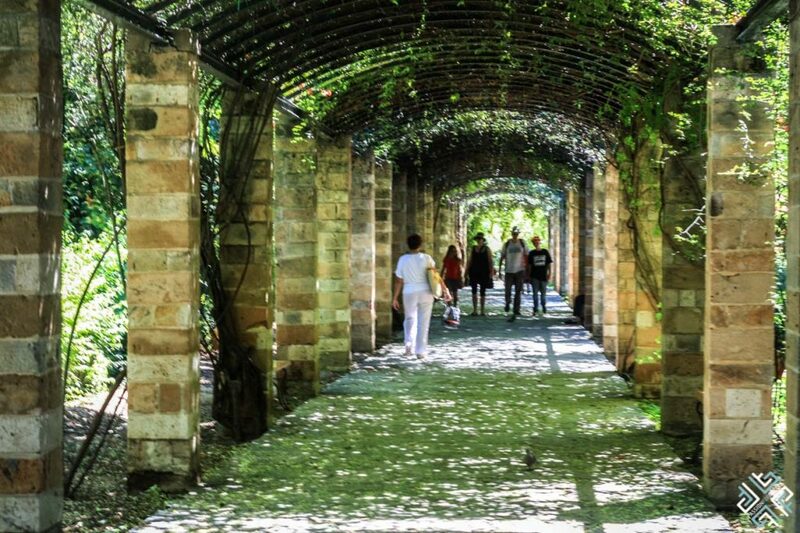 The National Garden is set right in the heart of Athens and was once a private refuge of the King and Queen. Queen Amalia was greatly fond of the garden and would spend endless hours there. 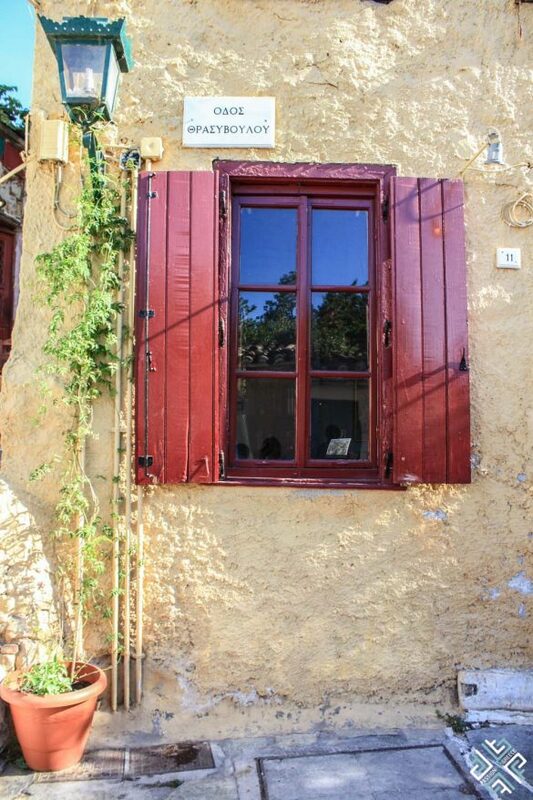 This peaceful retreat is a wonderful oasis inside the bustling city of Athens. You can either enjoy it at your own leisure or join one of the suggested Athens tours. You can read about the Neoclassical Athens and Dine Like Athenian Aristocracy tour which I have been on. 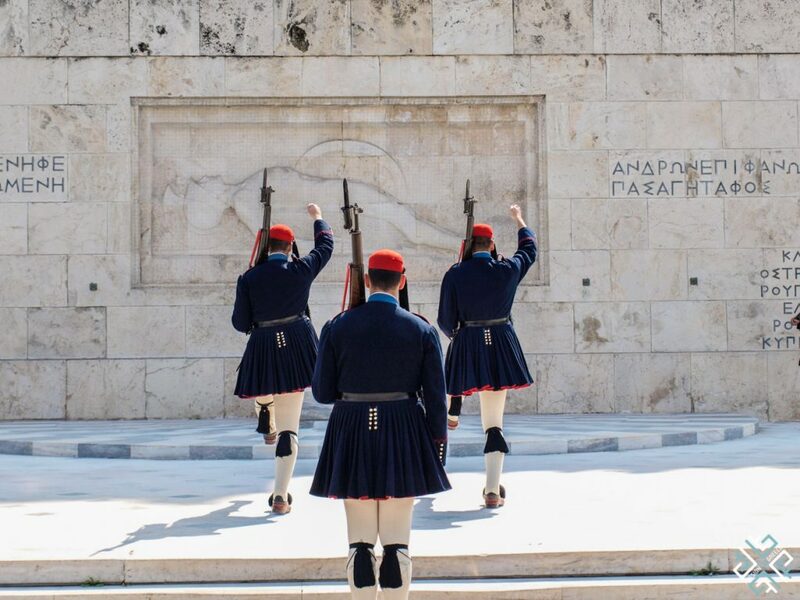 The beautifully dressed guards that you will encounter in front of the Hellenic Parliament are members of the Presidential Guard and are known as the Evzones. It is considered an honour for the young gentlemen to be selected to serve this position during their military obligations. You can watch the changing of the guards every day, every hour on the hour. 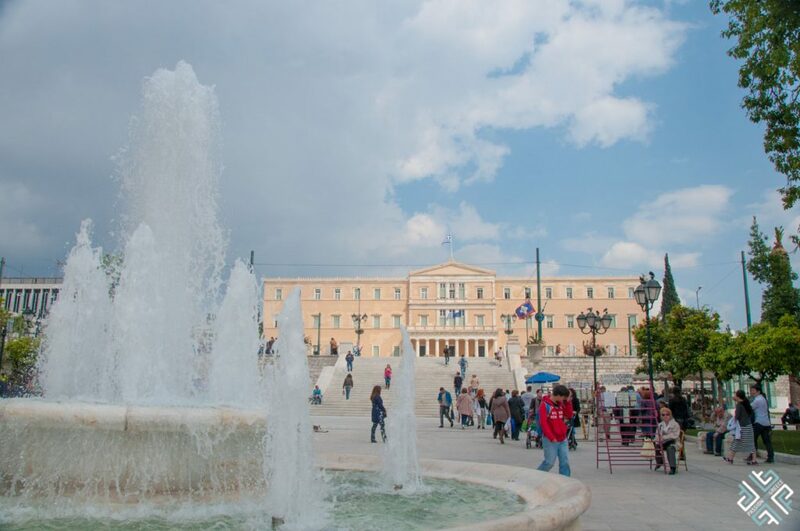 Syntagma Square is the main square of Athens and the one that received its name from the Constitution that the first King of Greece Otto was obliged to grant. Here you will find the Greek Parliament building which initially served as a palace of Kings Otto and George I. 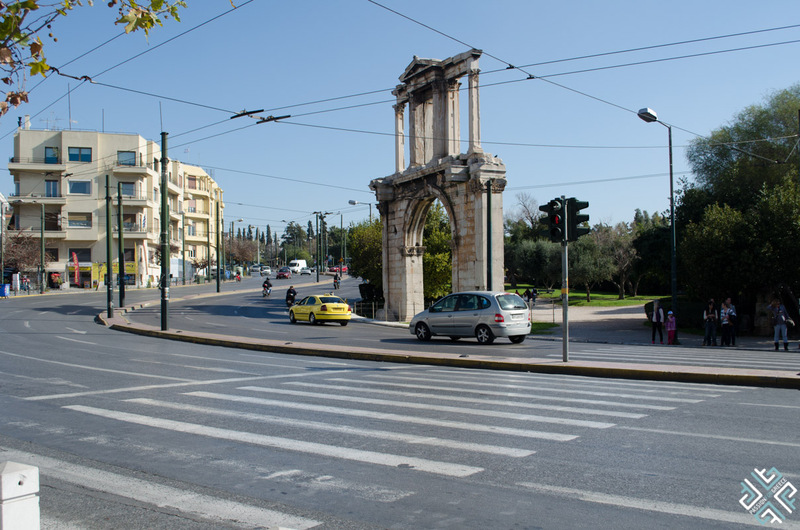 From here the square extends to the Ermou Street which is the central shopping street of Athens and is one of the first three streets that were designed in modern Athens. 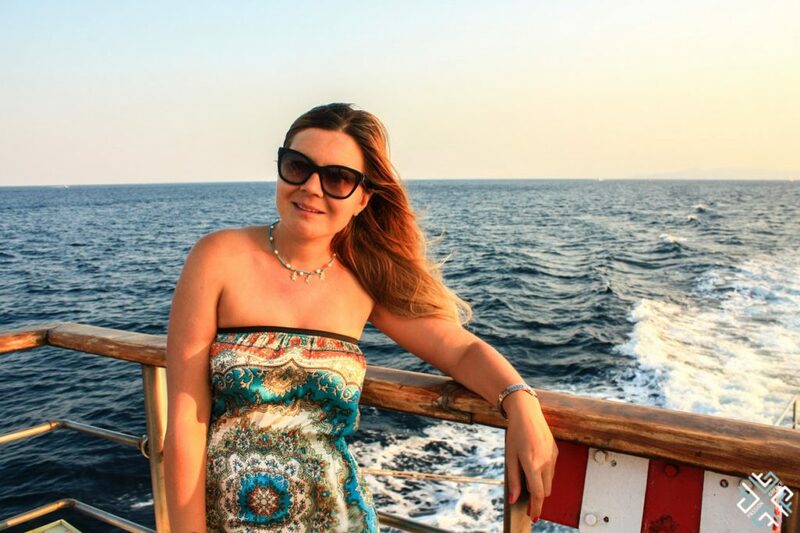 Read more about my experience with Discover Greek Culture Athens tour. 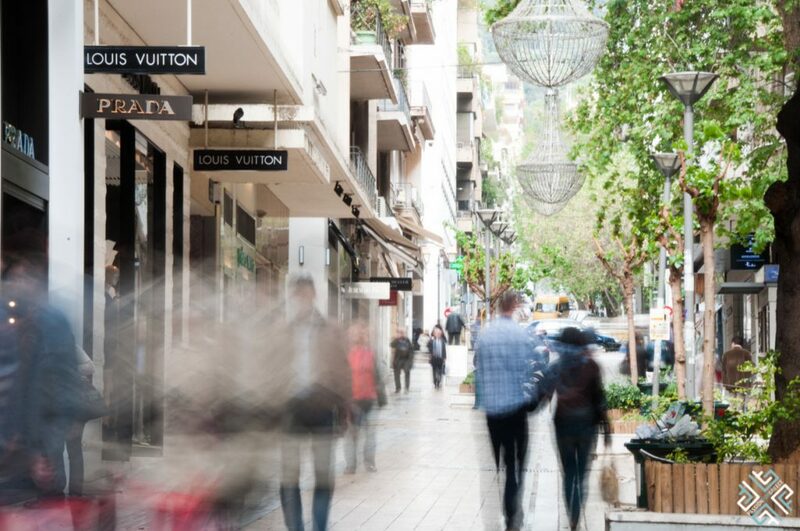 At a close walking distance from Syntagma Square you will find the Voukourestiou Street in the Kolonaki district which is lined with high-end boutiques like Prada, Dior and Louis Vuitton. There is also the Attica Department store where you can shop for anything from cosmetics to designer clothes. 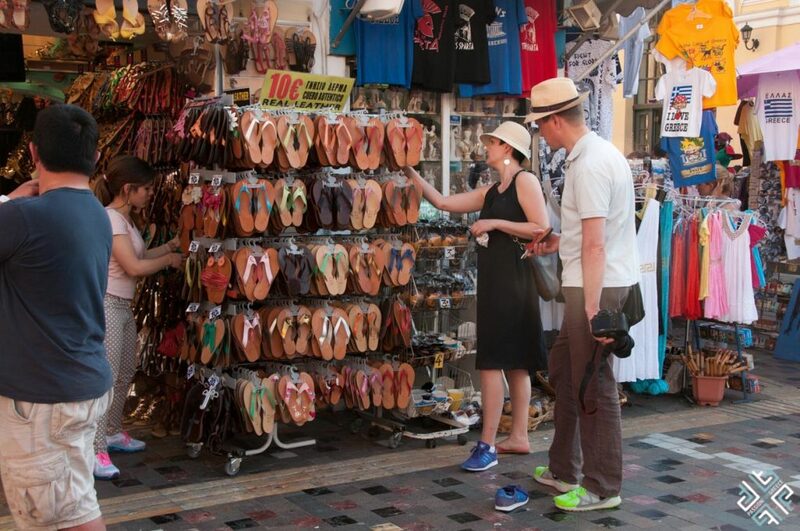 For souvenir shopping head to Monastiraki where you will find endless shopping opportunities. On the second day of your four day Athens itinerary, I recommend that you take a break from exploring the city centre and head out to discover the Athenian Riviera. 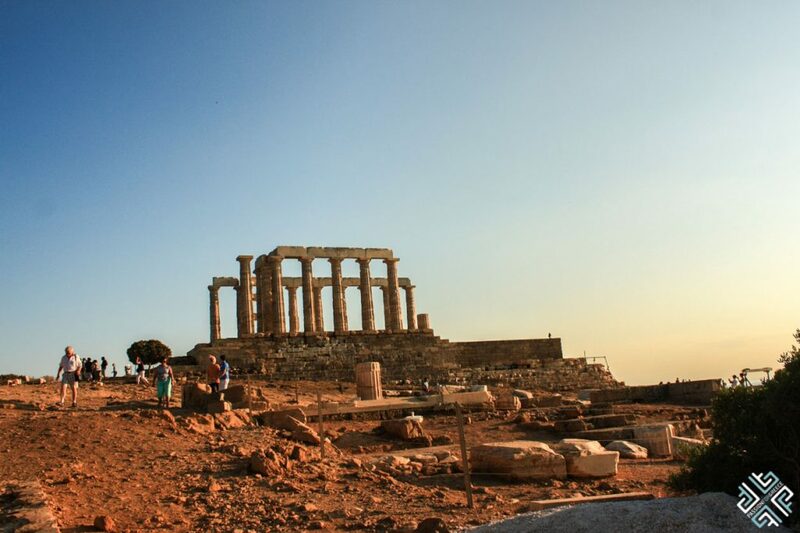 Unless you have rented a car and decide to visit the Cape Sounio by yourself, the best and easiest way to do it is book an afternoon tour. Visiting the Temple of Poseidon which is located on the southernmost tip of Attica region is a must when you are in Athens. 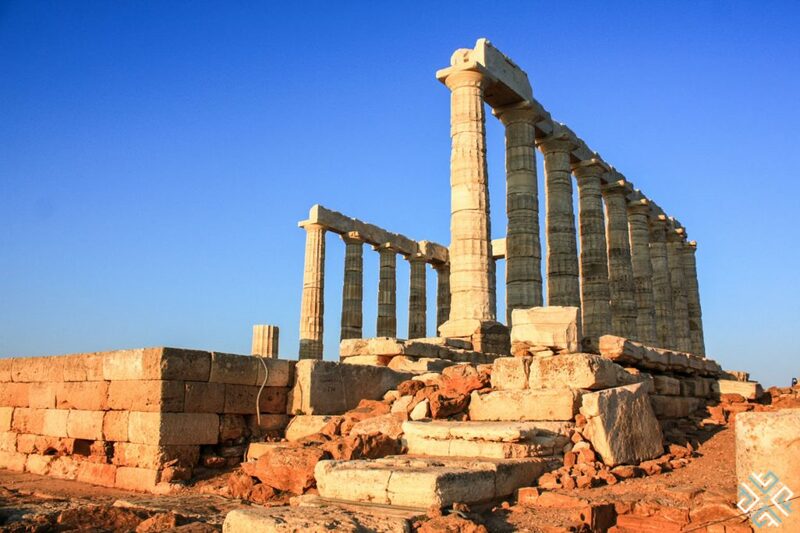 The afternoon tour ( Cape Sounion with Guided Tour in the Temple of Poseidon) will take you along the coastal road past the famous beaches of Glyfada, Vouliagmeni, Varkiza and other coastal towns. The duration of this tour is approximately 4 hours which means you will be back in Athens in time for dinner. 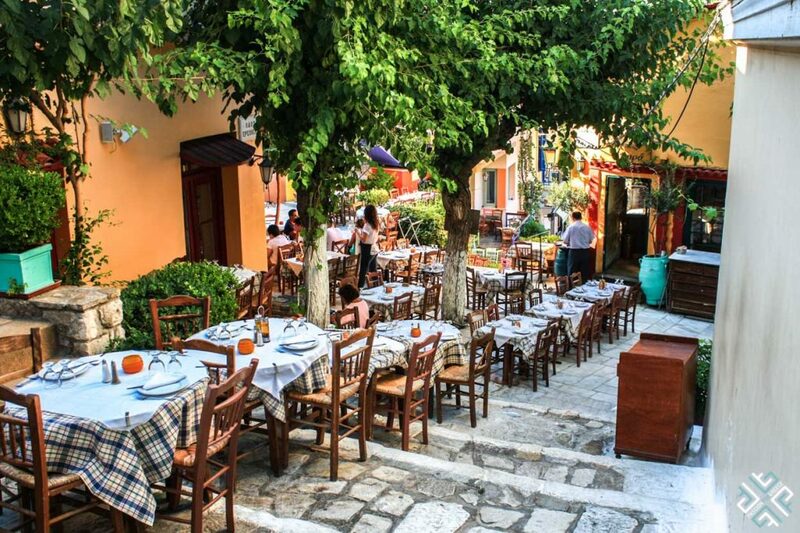 Check out our post on the best Restaurants and Bars in Athens. On the morning of your third day in Athens, your 4 day Athens itinerary will take you to discover more of the city center. The Varvakeios Central Market is located a short walking distance from the Monastiraki Square. Continue your 4 days in Athens itinerary with the following options. Of course you can always move your program around depending on whether or not you are going to do any tours. This bustling central market is an absolute must experience when in Athens. 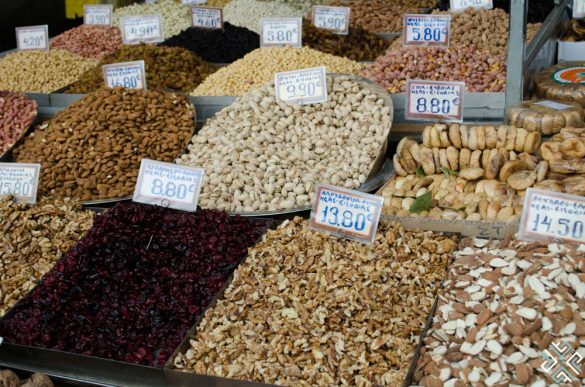 Selling everything from fresh fish, meat, fruits, vegetables, spices and other products — it is an exciting part of the city. 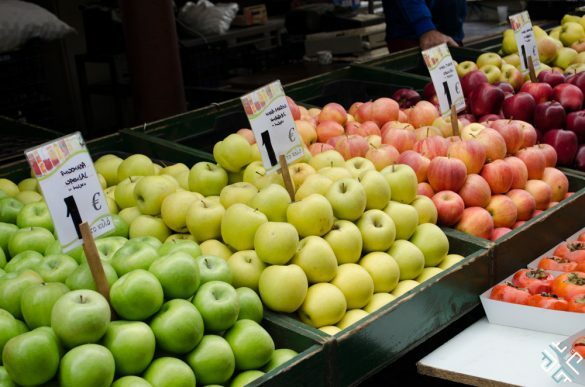 The best time to visit the market would be in the morning or the first part of the day. 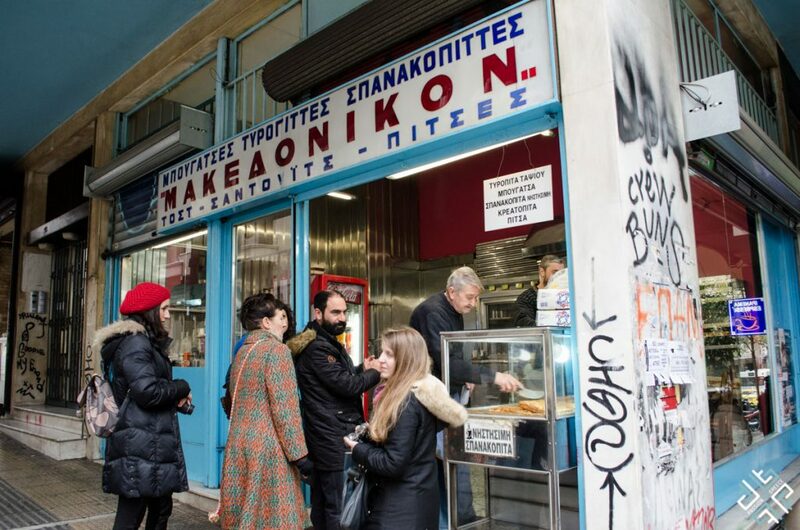 If you wish to get a closer introduction to the fascinating food culture you can either opt for a Food Tour of Athens (read about my Food Tour experience here) or even better learn how to cook Greek food with Vasia (book the same experience here). Watch the video of my cooking experience below. 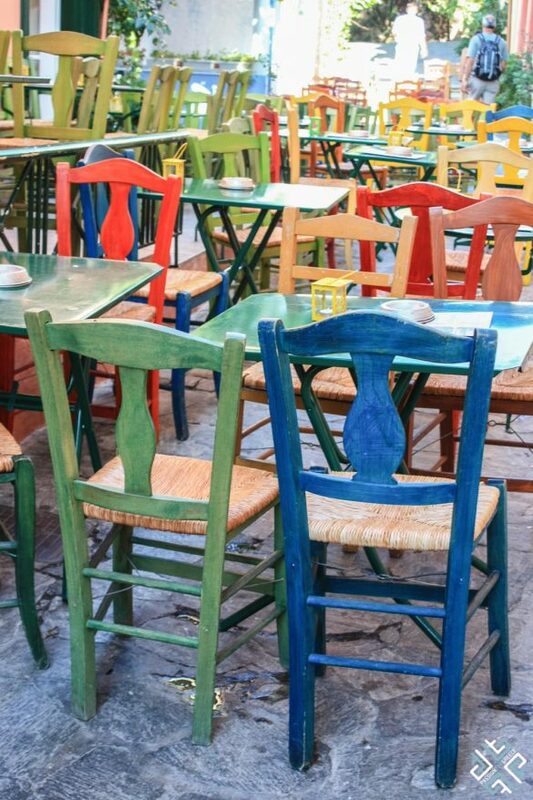 The lively Monastiraki Square is a juxtaposition of eras and cultures, an all day centre of activity it includes attractions such as Hadrian’s Library, the Ancient Agora as well as the popular Flea market selling souvenirs, sandals and Greek artisan products. The square is connected with the Athenas Street which is the location of the famous Varvakeios Central Market. Here you will also find a few popular rooftop bars such as A for Athens and 360 Bar. 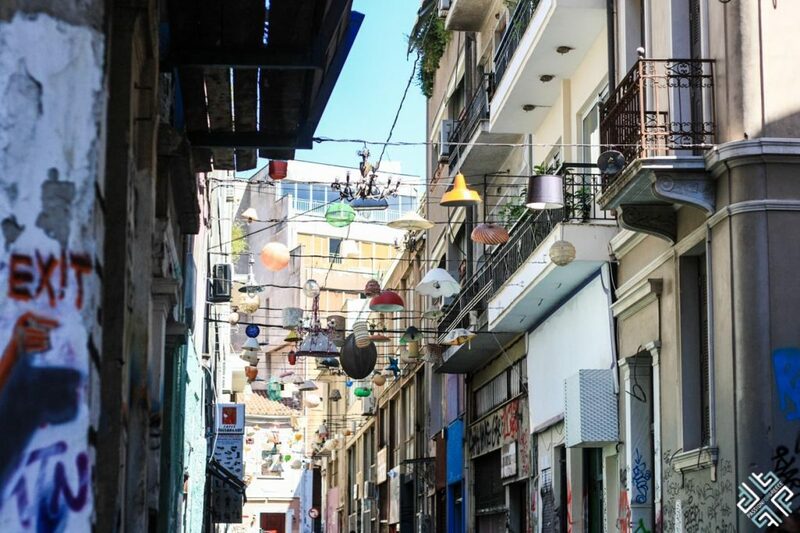 At a close walking distance from the Monastiraki Square you will come across the famous street of the hanging lights — the Pittaki Street which is decorated with numerous lamps, chandeliers and lanterns. 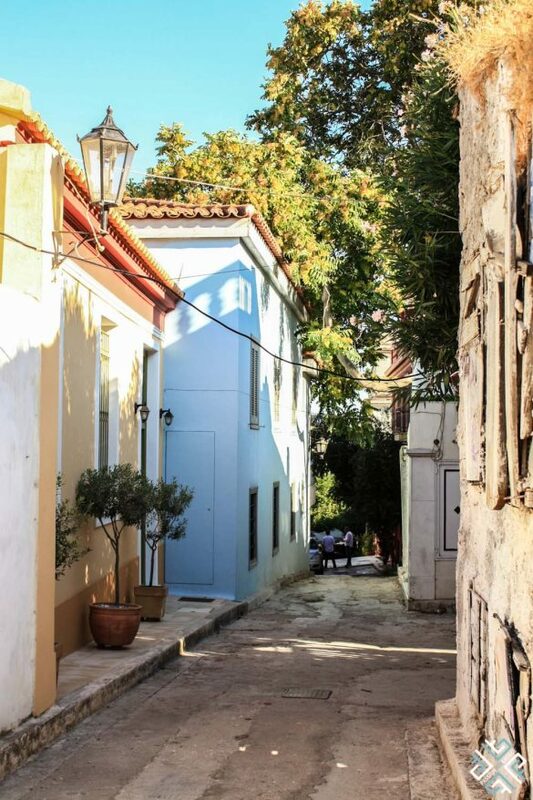 The Pittaki Street leads towards the lively neighbourhood of Psyrri — where you will find many restaurants, bars and local taverns. Built in a typical Roman style the Hadrian’s Library was completed by Emperor Hadrian in AD 132 — it also housed music and lecture rooms. The impressive columned facade has been well preserved until this day. It is best to visit this landmark in the first part of the day as it closes at 3pm. Once the heart of ancient Athens, the Ancient Agora was the hub for all the political, commercial, administrative and social activity. It was also a religious and cultural centre. This landmark is important for the significance of its history rather than the buildings which are found here, thus if you do find history fascinating my advice for you is to take a guided tour. 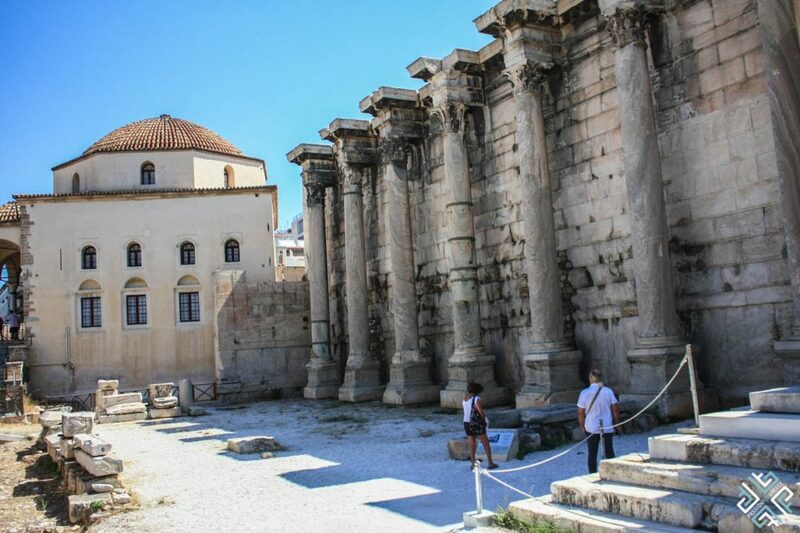 There are various tours which you can take — the Athens Mythology Highlights Tour or if you specifically just want the tour of Agora you can book the Guided Tour of Ancient Agora and Agora Museum. 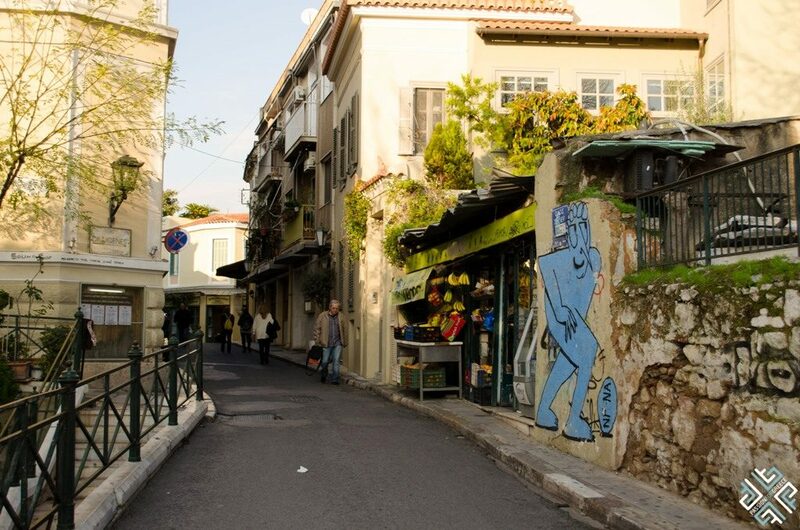 Athens may not come to mind as a city famous for street art — however you will be surprised. The street art in Greece was around since the 1980’s however it gained momentum in 1998 when the Greek capital organized the first international graffiti festival, an initiative of the Hellenic-American Union, which was held northwest of the Acropolis. 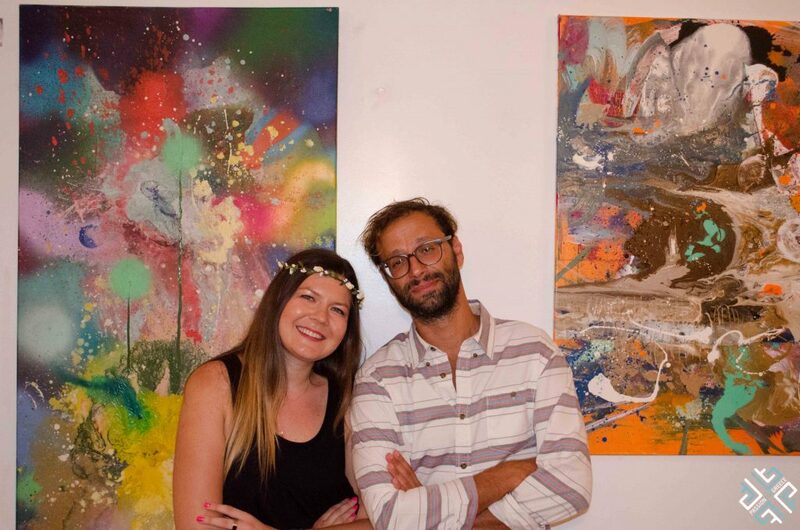 A group called Carpe Diem, one of whose founders was Vangelis Hoursoglou (a.k.a Woozy), was established to support graffiti artists and to provide them with legal basis as well as with canvases. 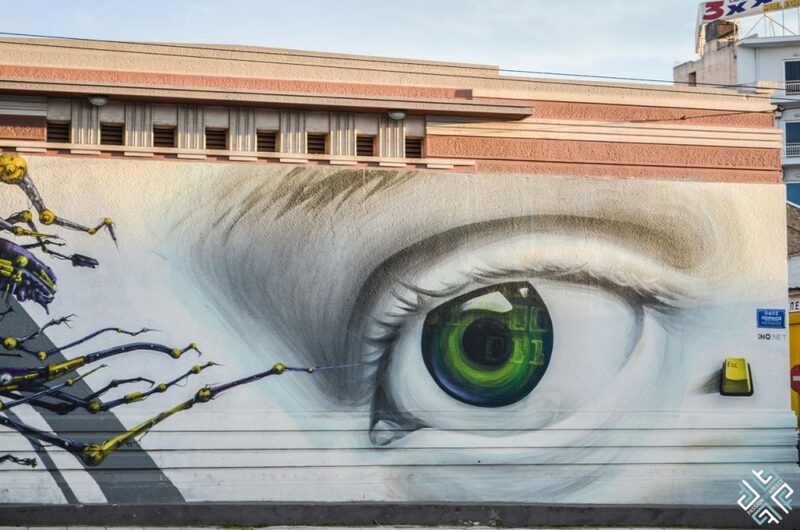 Visit the three neighbourhood of Athens on a 3 hour Street Art tour and learn all about the fascinating masterpieces which decorate the walls of Athens. You can also read about my experience of this tour here. 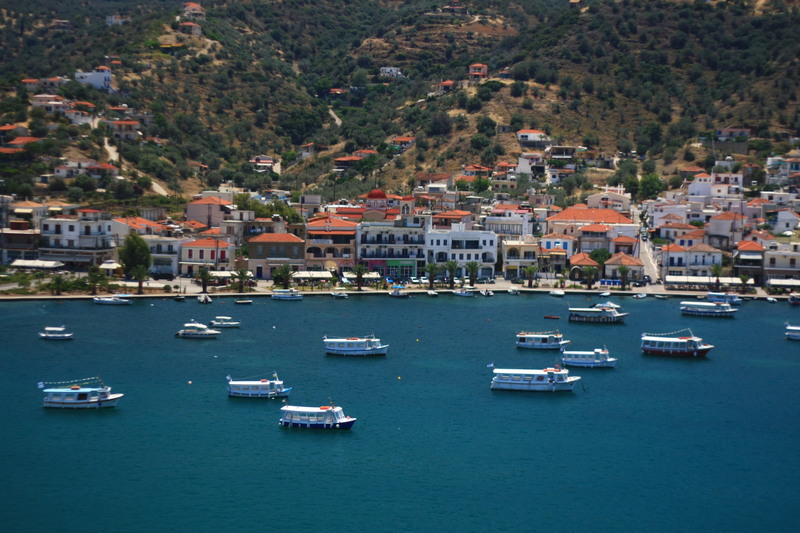 On your fourth day in Athens we recommend that you take a day trip to either the Greek islands or Delphi, depending on the season. 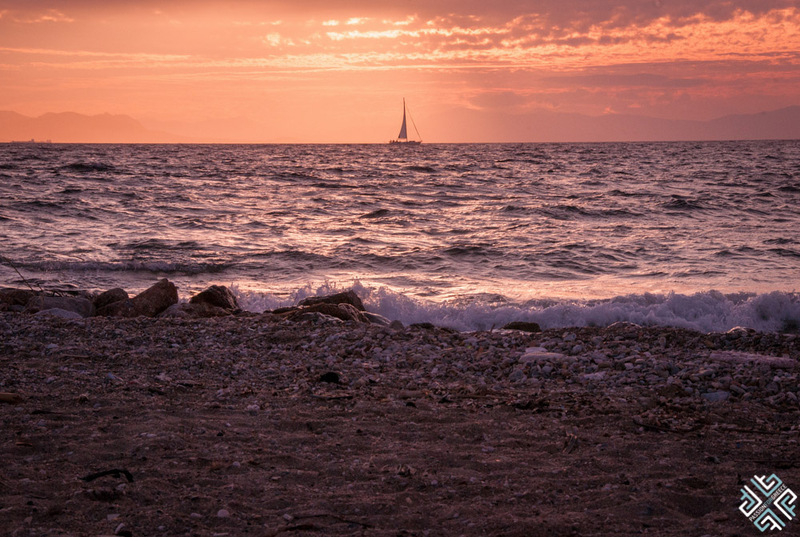 If you are visiting Athens in the summer you can also spend the day on the beach in the Athenian Riviera. If you decide to go to the beach and you are staying in the centre of Athens, you can take the tram from Syntagma Square (number 5) with the final stop in Voula. You can also spend the morning shopping in the area of Glyfada which is filled with numerous boutiques, coffee shops and restaurants. 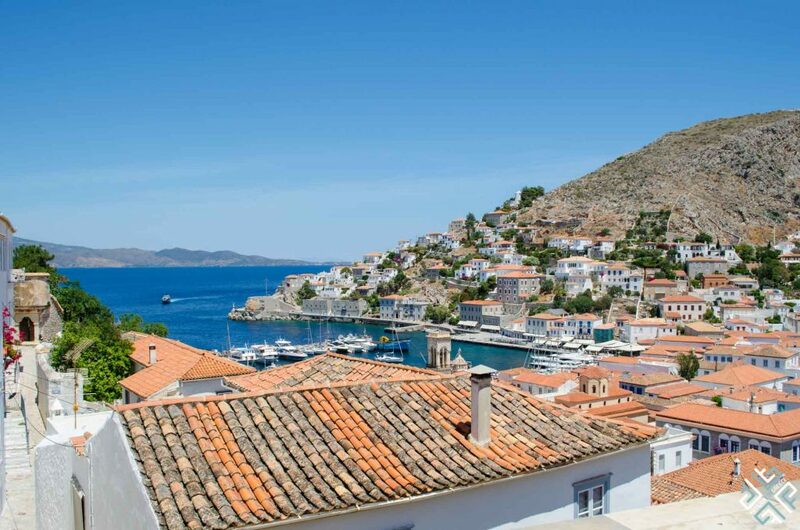 Start your day early at 8 am and board the vessels which will take you on a vibrant excursion around three Greek islands — Hydra, Poros and Aegina. 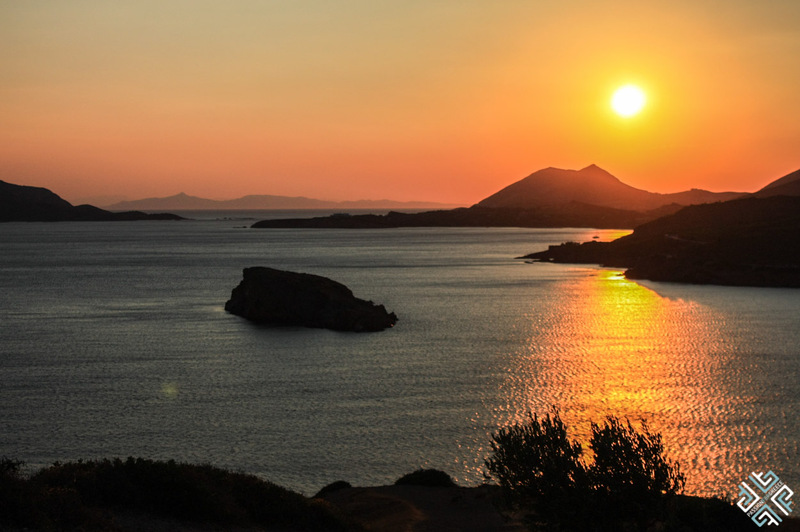 Discover the beautiful island life, enjoy onboard entertainment and experience some of the famous Saronic Islands. Weather permitting you can do this cruise at all times of year. Read all about my experience here. You can book the same experience here. 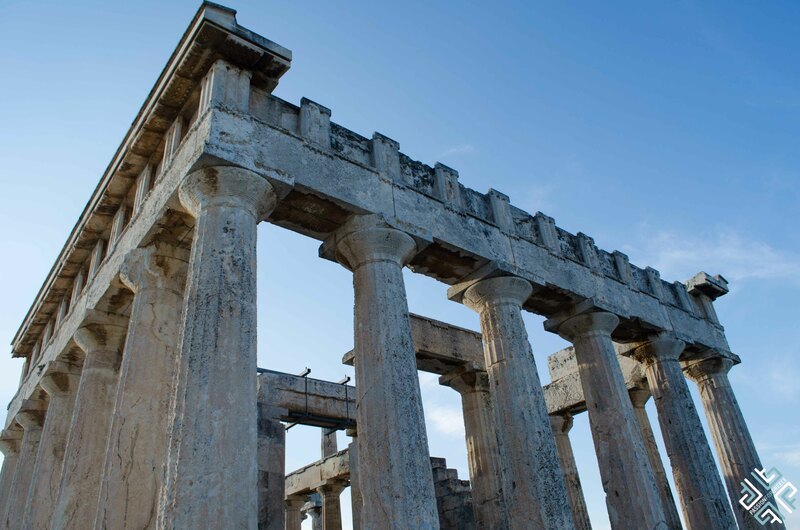 If you do opt for the three island day cruise from Athens, make sure to visit the Temple of Aphaia. The temple was built at an equal distance from the Parthenon in Athens and the Temple of Poseidon. 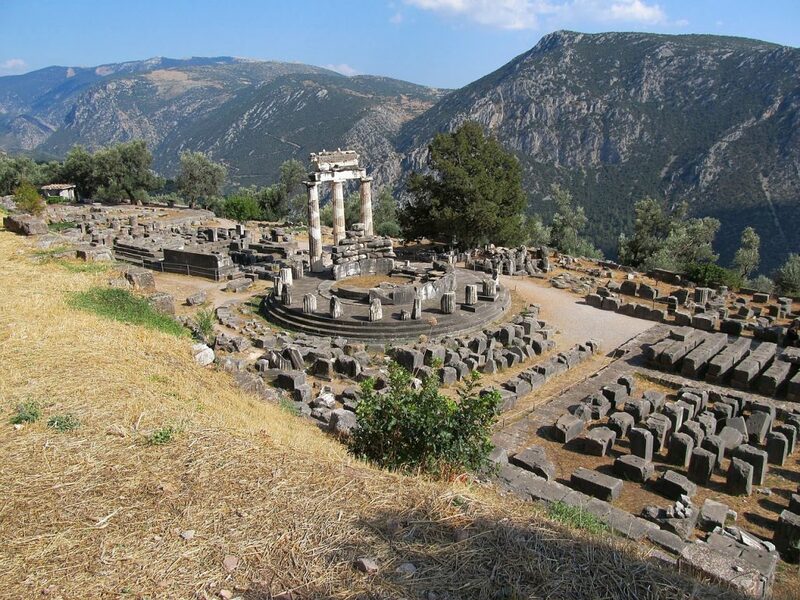 If you are visiting in winter and swimming is not an option you might like to take a day trip to Delphi. On this trip you will explore the Omphalos which is the Navel of the Earth and visit the remains of the Sanctuary of Apollo Pythios. You will also pass the towns of Livadeia and Arachova set on the slopes of Mount Parnassus, a popular winter ski destination in Greece. This is a full day tour. You can book you experience here. 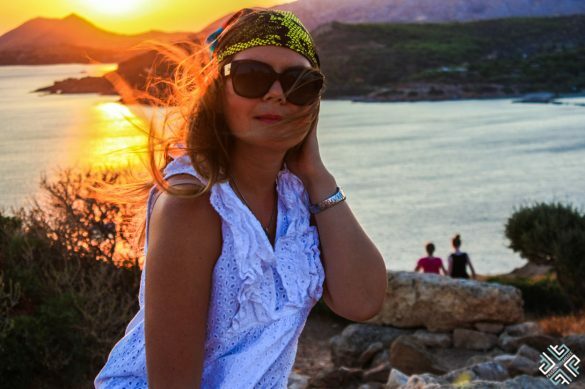 As you can see for yourself Athens offers its visitors a whole array of experiences, from historical monuments to endless cultural activities, fun tours, world class dining, shopping, fantastic beaches and much more. 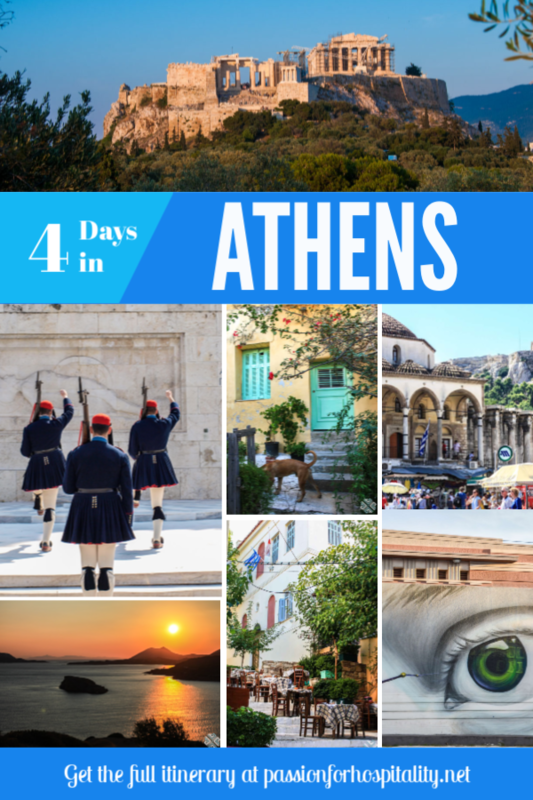 You can easily spend 4 day in Athens or more. I hope that this itinerary will give you a glimpse of what this wonderful city is all about. If you have any questions, don’t hesitate to get in touch! In the meantime have fun planning your trip to Athens. Disclaimer: This post contains affiliate links. This means that should you click on certain links, and then subsequently purchase a product, I will receive a small commission at no cost to you.